I have gotten a few questions from my readers about how I paint my furniture pieces. In short, spray painting. 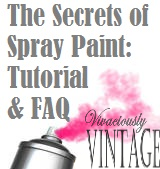 Yes spray paint from a can! It is by far the easiest and fastest method I have found, albeit not the most cost effective...which is why I am always trying new ways! I foresee a compressor and spray gun in my future! However, the steps in this tutorial will remain relevant! First and foremost always wear a mask and spray in a well ventilated area! Don some surgical gloves or something similar if you want to keep your fingertips paint free! Most paints require that it is at least 50 degrees outside for a good finish. Step 1: Remove the Hardware. Pretty self explanatory. Of course if you want to paint it the same color as your piece...you might as well just leave it in place. Step 2: A. (Optional) Sand? I don't always sand my pieces, in fact - I try my hardest to avoid it. However, some pieces need a good sanding. So, use your judgement! B. Degloss. This is normally my second step. 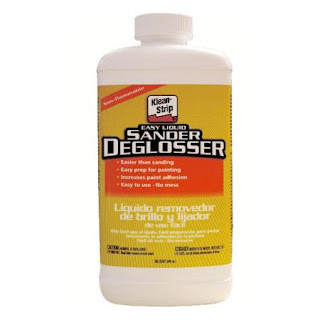 If you have determined that you do not need to sand your piece, then clean it with a good liquid deglosser. You can get it at any home store, and it preps your piece for painting by helping remove some of the glossiness. Follow the directions on the back, but for me, I just put it on a rag and wipe all of the piece until it's clean. Let's face it, most of your pieces are probably going to be grungy and dirty - so instead of just wiping it down with water and soap, use a deglosser for a better outcome. Below is the brand I use. Step 3: (Optional) Repair. Another less fun step, but sometimes a piece of furniture needs a little help. Make any necessary repairs. Is a piece of the drawer broken off? Is there a giant gouge? Personally, I will leave little dings and nicks in the finish because it adds character. However, if there is a giant gouge or some similar eyesore, I repair it. Typically, I am able to repair pretty much any problem with just use a paintable/stainable wood filler and/or wood glue. For specifics, follow the directions on the back of your product. Essentially, it's apply, wipe off excess, let dry, sand the area for an even finish. Be sure to wipe off any new dusties with a damp or tacky cloth before priming. Step 4: Prime. Apply the primer in thin coats. I am usually able to get it all covered in 2 coats (maybe I should go thinner!). You want your piece to be fully covered - especially if you are going a very light color or white! You do not want any haziness or the dark original color of the wood showing through! If you are going black or dark, I recommend using a grey primer (available in different brands) or I have used Krylon's Dual (paint and primer in one) with success. I just do not like that it takes longer to dry. Do NOT prime in white then spray paint black (or any other very dark color, I imagine)...you will want to kill yourself because it requires like a thousand more coats (yes, 1,000!). Trust. Application Technique! This technique is for priming, as well as painting. As always - thin and even coats. Hold the can back anywhere from 6-12 inches (what does it say on the back of your can? ), and apply in sweeping, side to side or up and down strokes. At the end of each stroke, release the nozzle so you don't have a ton of paint building up on the ends! Slightly overlap each subsequent stroke to ensure a more even coverage. Usually, by the time you are done with the first coat... the allotted recommended recoat time has passed (Krylon recommends 2 minutes). So, just go back to the beginning and repeat. Step 5: Paint! Probably the best part! This is where you get to see your masterpiece start to emerge! Just like the primer, apply the spray paint in thin and even coats. I do not have any set number of coats that I apply; I just keep going until the coverage is complete and even. It is usually at least 3 coats. Be sure to follow the instructions on your can according to recoating, drying, and handling times. Sometimes you have to add another coat later. Countless times I have brought a "finished" piece inside (into better light) and noticed spots I missed. I haven't played around with too many different brands of spray paint because I fell in love with the nozzle from Krylon. Since then, I don't buy any other kind. The nozzle on this paint is adjustable and it allows you to spray in a wide stream that is either vertical or horizontal. Step 6: (Optional) Extras. I love extras! After painting is when you would add any extra pretties that your ❤ desires. This might include glazing (which I normally do not do Step 7 on top of), hand painting (which I highly recommend following up with Step 7! ), decoupage, distressing, etc. Step 7: (Optional) Polycrylic. This step is optional and up to you. I use polycrylic on pieces that will get a lot of wear, like a desk or coffee table. I'm lazy, so I normally will do just the table top. 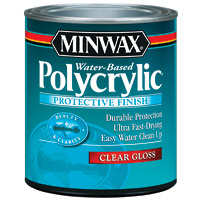 I prefer to brush on my polycrylic because it just seems like it is better protection. However, it does come in spray cans as well. It also comes in different sheens: gloss, semi-gloss, and satin. It's awesome because it's water based and does not yellow like polyurethane, and clean up is easy. Be sure to use a high quality brush for this step...you don't want to be picking little horse hairs out of your masterpiece! Step 8: Reattach your hardware. Check out this fancy lady that I did following all of the above steps! Help! I got a drip or run! So maybe that's not an actual question. Sue me. When I was first using Krylon's spray paint I got drips, lots. I was totally ready to give up on spray paint. It took some getting used to. I think the problem was that it really wasn't warm enough for me to be spraying. In the case of a drip, let it dry completely, as in all the way; no cheating! Sand the spot down and repaint. To sand or not to sand? Now that is a question! lol. Usually, the only reason I sand is if the finish is flaking off or if there is some type of bump (like a hunk or dried glue or something). No amount of painting is going to hide a flaky, bumpy finish! I take more care with these type of imperfections if they are on a table top, etc. What primer do you recommend? 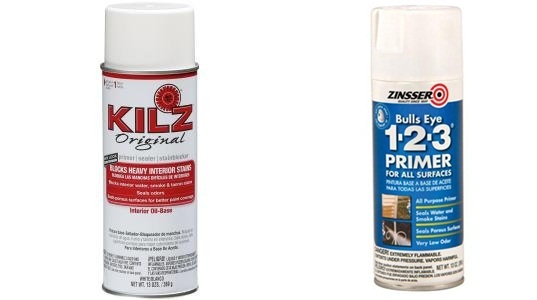 As I alluded to with a photo in the tutorial, my favorite brand is KILZ. It covers and sticks very well because it is a bonding and stain blocking primer. Be sure to get the oil based kind, I have found that works better. The can says to shake for 1 minute, but you want to shake that baby for 2-3 minutes to avoid a slightly rough finish. Don't worry, shaking this baby is not illegal. ;) Although, apparently buying spray paint under age is....I got carded for spray paint before!!! Update: I have also had great success with Zinsser Bulls Eye 123 primer. It's a cheaper and you can topcoat in 30 minutes instead of an hour! Does the brand really matter? Yes, no, and it depends. You don't have to buy Krylon or KILZ, but don't get the super chepo stuff. It's crap. No really, it is. Rustoleum is nice, Valspar is okay...I think I'd choose Rustoleum before Valspar...that is, if I bought anything other than Krylon. :) I am guilty of buying cheaper stuff for small items. Like picture frames and their frame mats. I figure that kind of stuff does not get much handling, so it still holds up nice, and the Krylon nozzle is not make or break here since the project is so tiny. As far as primer, well you can use whatever kind you like...but if it is not a bonding primer, then you had better sand before priming. But, who wants to do that??? So, get a bonding primer! Priming + painting versus paint & primer in 1. The paint and primer in 1 is good for some projects. Basically, if you are going from a dark piece to a lighter paint color you had better prime that baby separately, then paint. Personally, I have only had success with it in black and red in Krylon's Dual. I used black on a desk that I knew I would be distressing, so I wanted the wood to show through and not primer. I used red on the vanity pictured above, but I was going from one tone of red to another. I tried using their white paint and primer in one on a dark piece (I skipped the KILZ primer) and...well it did not cover, like at all. I went back and primed with KILZ and repainted. Also, if your surface is very smooth and shiny I would use KILZ instead of a 2 in 1. I'll update this post when I get more questions, or think of something else awesome to add! I might even add a video of my technique if I'm feeling froggy! Hope this was helpful! Happy painting!!! one more question =) so I want to apply some chalk paint on the side of my cabinet (don't worry, they're not expensive and they're super old) Do I need to sand it so the paint will stick better? It would be my first painting project =) Thanks! Hi Jacqui! I have not used chalk paint personally (although, I have some plaster of paris in the garage waiting for my trial and error paint making process! ), but from what I understand chalk paint is awesome because it does not require any prep at all. No sanding or priming, and it still gives great coverage! However, you do have to use wax over the paint; otherwise, it will remain 'chalky' and flake/rub off. The wax is basically what causes it to cure! Work in small sections - use clear wax first. Then if you want an antiqued look, follow that up with a dark wax (before the clear wax dries!) to stick in the groves and imperfections! Good luck and let me know how it turns out!!! thx! I'll keep you posted! Thank you so much for taking the time to create this post! I'm one of those people who's scared to use spray paint!! You made me feel more confident!! This is soooo helpful, thank you. You're welcome - thanks for stopping by! You are one of my favorite blog writers. You give information an personality, it's helpful and fun to read your posts! Get posts deliverd via email! EASY Beginner Chevron Crochet Baby Blanket! Only ONE Stitch to Learn! How to Dye Upholstered Furniture! Copyright Ansley Designs 2018. Awesome Inc. theme. Powered by Blogger. Like what you see? Lets stay connected!